The history of horse breeding in Europe has been greatly influenced by the monarchy. King Athelstan (925-940) was probably the first monarch to influence the breeding of horses in England when he passed laws forbidding the export of horses. Little was done to actually attempt to improve the quality of the british horse until King Henry VIII caused an act entitled "An Acte concerning the breade of Horsys". He was concerned that too many small horses were being bred and ordered that any mares under 13 hands high or unlikely to produce foals of "reasonable stature" were to be killed. Luckily the Mountain and Moorland ponies survived in their natural habitat in spite of the laws aiming for their extinction. King James I also played his part in promoting horseracing and improving the breed. He started the first racecourse at Newmarket and was also the first to import an Arab Horse of which we have any record -The Markham Arabian (unfortunately the horse proved of little use either at stud or on the racetrack). King Charles I was another accomplished Royal horseman - he loved to ride in the menège. However during his reign the breeding of light horses became so popular owing to the great interest in racing that all other types of horses were neglected - so much so that Charles Iwas presented with a petition asking that steps be taken to encourage the breeding of heavier work horses. Oliver Cromwell is said to have kept a racing stud before becoming Proctector. He changed his ideas later, as in February 1654 he issued a Proclamation against racing for six months. But, as he had a fondness for hunting and hawking he took measures to encourage the breeding of horses for these sports. At The Restoration in 1660 all sport revived and horseracing flourished once more at Newmarket. 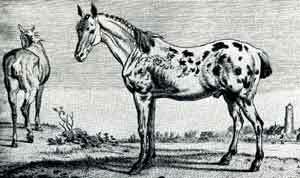 King Charles II imported many Arab sand Barbs including the "Royal" mares from which our modern thoroughbreds descend. King William III did much to encourage horsemanship, establishing a riding school in the charge of Major Foubert, a French Officer. He also kept a a stud of racehorses at Newmarket under the famous Tregonwell Frampton. The Byerley Turk, one of the legendary three foundation sires of the modern thoroughbred, was imported during his reign. The reign of Queen Anne was the one which saw the greated progress made in light horse breeding. The Queen kept a fine stud herself at Newmarket and many famous horse were imported at this time including The Darley Arabian, another of the famous 'foundation sires'. In the rest of Europe breeders were in a better position to improve the breeding of their horses with the import of horses from North Africa and Arabia, these countries being closer to them thanto Britain. This made a huge improvement to their riding stock and the Neapolitan, Spanish and Portugese horses became famous all all the world.